November in UNISON was Grovember – an all out push across the union to grow our membership. Although UNISON is now the largest trade union in the UK, there are still many more public service workers who are yet to receive the benefits of membership. And of course, the more members our union has, the stronger it is and the more often we can win on the issues that matter to our current members. Recruiting and campaigning can be daunting – but it can also be fun when groups of UNISON reps get together and pool ideas. There were a lot of great events across the country and a lot of creative ways of engaging future members that are worth sharing! 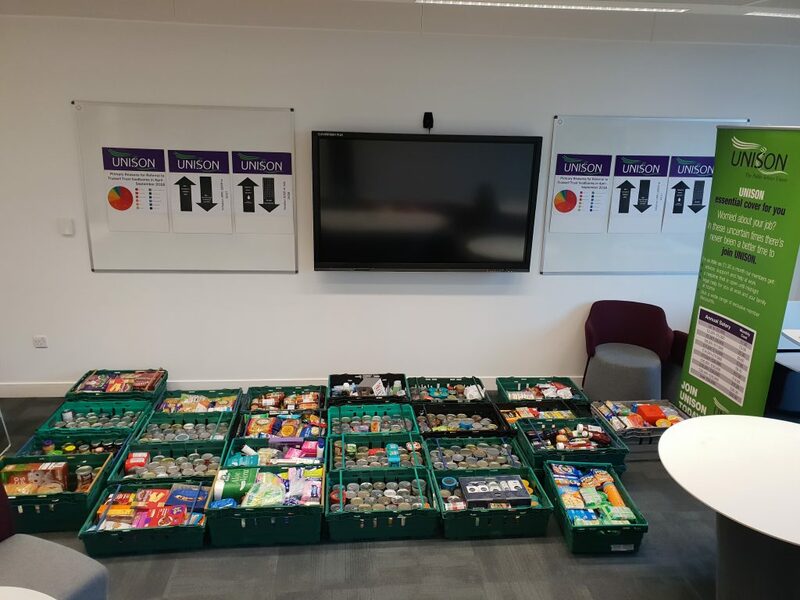 At Solent University, Southampton District branch organised a food bank collection. The branch produced a flyer that listed the food and toiletries that were specifically needed by the charity and reps spread the word across the campuses. This proved so successful that most of the 20 crates left for the whole two hour session were full after a busy opening 30 minutes – and more had to be delivered by Southampton City Mission Basics Bank to help cope with all the extra food! This was against the backdrop of soaring food bank referrals. Between April and September 2018, 30.71% of referrals to Trussell Trust food banks were due to low income. This meant the branch was able to do a good thing and help those who need it at a difficult time of the year – but also keep in work poverty on the agenda after the higher education ballot failed to reach the threshold set by the governments’ anti-democratic trade union legislation. Activists from Hampshire Local Government Branch offered members and potential members the opportunity to develop their professional skills and build their confidence with a ‘Power to be you’ taster session. Staff at Gosport Discovery Centre and at HCC headquarters in Winchester attended the workshop in their lunch break – with lunch provided for free – thanks to applying for a ‘Kickstart’ grant through UNISON’s Inclusive Learning Project. This short workshop looks at ways to improve your confidence both at work and in the rest of your life, and invites you to make small changes that can make a big difference to how you perceive yourself and are perceived by others. The ‘Power to be You’ WEA course can be arranged in your branch if you have a group of members who would like to attend. Talk to your branch Union Learning Rep or Lifelong Learning Coordinator to help you to arrange this. Staff at Fareham Council were invited by their union to attend a ‘winter warmer.’ The branch purchased special ‘Fareham UNISON’ mugs and paired these with packets of hot chocolate powder. Staff who visited the drop in were able to take one of these away with them so that they could have a warm treat at their desk and remind their colleagues of their UNISON membership. UNISON members were also able to collect a free UNISON branded fleece blanket. With winter definitely here, this practical gift is essential part of the AA winter driver emergency kit. Cold weather can be a health and safety risk, so the branch wanted to help make sure that members were at least kept warm if the worst happened and they found themselves stuck in the snow for an extended period. After all, it might be hard to remember the last white Christmas, but no one who was stranded in the snow will forget last March in a hurry. Gosport Borough Council UNISON activists organised a lunchtime drop in Health and Wellbeing event. Members could see the pharmacist to get their flu jab and have their blood sugar and cholesterol levels checked. The local Leisure Centre offered weight checks and complimentary day passes to try out the swimming pool and gym, as well as general advice on leading a fit and healthy lifestyle. Lunch and free fruit to take back to desks rounded off a really successful day. Got an idea for an event you could help your UNISON branch organise? Get in touch!